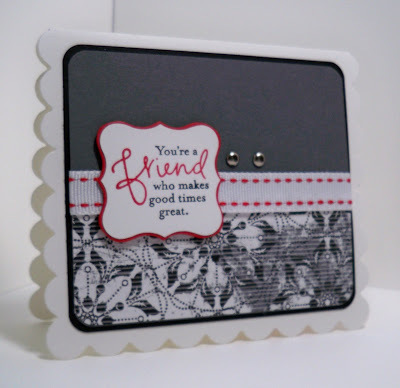 Trinity Designs: Bloggers Challenge - Punches and Dies! Happy Friday stampers! I am so glad it's Friday - what a week it's been - have you had one too? Yep, I know, you need some stamping therapy! So after you check out my post today, send me an e-mail and tell me you're coming to stamp with me tomorrow morning at the Just Cards class. There is still plenty of room, but I need to cut supplies for you, ok? For today's Blogger's Challenge, we had to use Punches and/or Dies. Well, I ended up using both to make this card, and I am SO happy with how it turned out. I started out by cutting my Whisper White card base (which was folded in half) with the Scallop Square Die in my Big Shot. I created this wonderful size notecard that still fits in our envelopes! Then I took out my NEW Night and Day Designer Series Paper which is coming in the Holiday Mini Catalog on Sept. 1st. I chose a pattern that reminded me of fashion - don't know why, but this piece did. I cut a piece and layered it onto a piece of Basic Gray cardstock and rounded all the corners with the Corner Rounder Punch. This was adhered to a slightly larger piece of Basic Black cardstock that I rounded the corners on also. The ribbon - which is also a sneek peek of the Mistletoe Ribbon Pack in the Holiday Mini (I'm using the other ribbon on tomorrow's project, so check back to see, ok?) is simply wrapped around the Gray and DSP layer and adhered to the back. 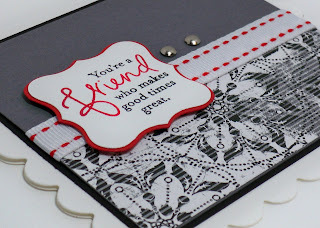 My greeting is stamped from the Great Friend stamp set which is one of my favs - I use it all the time! I colored the stamp with Real Red and Basic Black Stampin' Write Markers and once it was stamped on Whisper White cardstock, I punched it out with the Curly Label Punch. It's slightly bigger than the white punch out and makes a great layer - don't you love no waste? Once I mounted it with Stampin' Dimensionals to the card front, I used my Mat Pack and Paper Piercer to punch two holes next to it and added Silver Brads for an accent. It makes the card kind of say 'uptown chic' to me.....or not, but whatever, I still like it! For a last little touch, I stamped the butterfly from this stamp set in Real Red on the inside of the card. I've also included a picture of my inspiration for this size card - a RAK from my friend Gretchen Barron. She sent me this little card in a recent swap we did and I just loved everything about it! So, now that you've seen what I did with Punches and Dies, go check out the other creative stampers by clicking on the link in my sidebar. You will be so inspired by their creations! I'm loving the DSP (just ordered) and I've never thought of using this die this way! Terrific card and I wouldn't have thought it possible with these colors -- I am soooo casing this! Wonderful wonderful! I LOVE that card shape and ordered that die because of an earlier post of yours! Super cute Robin! Love it, Robin! That square die is on my list! Very pretty - you can't go wrong with that new DSP! Beautiful cards, I love the black/red/white ones!! Wow saving your cards...and love that you did..The new DSP is stunning.. Stunning! The color combo you used is gorgeous and I love the DP you chose. Ohhh...so pretty!! I love that new paper you used. Very cute card! 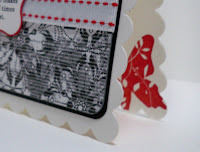 I love the idea of the square scallop used to make a card. LOVE the red white and black, very striking and pretty! Very stunning, love your colours, they look so modern. Love those scallop square cards! I've been doing quite a few of them, too! TOO cute!